On Monday the 22nd of July we held a Roda at Stockwell tube station in Memory of Jean Charles de Menezes. It has been eight years since Jean Charles de Menezes was shot at Stockwell Tube Station. From 2005, every year, we have been holding a Roda de Capoeira there, at the Memorial built to never forget this tragic event. Without speech, banners or flags, we show to our community that we are still around! 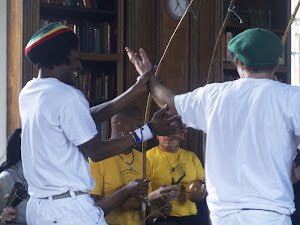 In the most peaceful way: with the empowering history inside Capoeira Angola. This year the roda was beautiful with a great energy. Many thanks to all that came.